Naval Air Station Fort Worth Joint Reserve Base (or NAS Fort Worth JRB) (IATA: FWH, ICAO: KNFW, FAA Location identifier: NFW) includes Carswell Field, a military airbase located 5 nautical miles (9 km; 6 mi) west of the central business district of Fort Worth, in Tarrant County, Texas, United States. This military airfield is operated by the United States Navy Reserve. It is located in the cities of Fort Worth, Westworth Village, and White Settlement in the western part of the Fort Worth urban area. Carswell Air Force Base, (1942–1994) was a United States Air Force (USAF) Strategic Air Command (SAC) base located about 5 miles (8.0 km) northwest of central Fort Worth, Texas, United States; the air force base is mostly within the Fort Worth city limits and has portions within Westworth and White Settlement. For most of its operational lifetime, the base's mission was to train and support heavy strategic bombing groups and wings. With the end of the Cold War, the 1991 Base Realignment and Closure (BRAC) Commission recommended that Carswell AFB be closed by 1994. This decision was later modified so that most of the installation would be converted into a Joint Reserve Base, retaining the Air Force Reserve presence that had historically been located at Carswell AFB and relocating Navy Reserve, Marine Corps Reserve and Air National Guard flying units from nearby Naval Air Station Dallas, that was also identified for closure. Several United States Navy headquarters and operational units are based at NAS Fort Worth JRB, including aviation squadrons, intelligence commands and Seabees. The Air Force Reserve Command's Tenth Air Force headquarters and 301st Fighter Wing continue to be based at the installation, as well as the 136th Airlift Wing of the Texas Air National Guard. A number of United States Marine Corps aviation and ground units are also co-located at NAS Fort Worth JRB. Aircraft types initially based at NAS Fort Worth JRB were the F-14 Tomcat, F/A-18 Hornet and C-9B Skytrain II. Current based Navy aircraft are the C-40 Clipper and C-9B Skytrain II. The only Air Force aircraft is the F-16 Fighting Falcon. The Texas Air National Guard flies the C-130 Hercules. Currently based Marine Corps aircraft are the F/A-18 Hornet and KC-130 Hercules. Recently, the Army based a squadron of RC-12 aircraft at NAS Fort Worth JRB. The base was named after Medal of Honor recipient Major Horace S. Carswell, Jr. (1916–1944). Major Carswell was returning from an attack on Japanese shipping in the South China Sea on 26 October 1944. He attempted to save a crewmember whose parachute had been destroyed by flak. He remained at the controls of his crippled bomber and died while crashlanding the B-24 Liberator near Tungchen, China. The base was renamed in his honor on 29 January 1948. Fort Worth Army Air Field, 29 July 1942 – 13 January 1948. The base was redesignated as Carswell Air Reserve Station on 1 October 1993 until its closure on 1 October 1994. 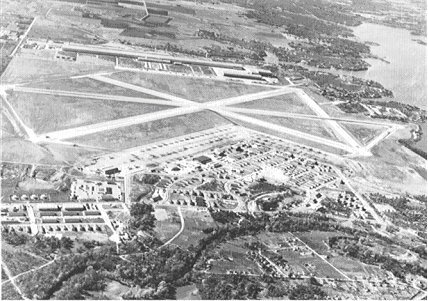 Oblique airphoto of Fort Worth Army Air Field in 1945, looking east to west. The airfield technical area is on the east side of the main north-south runway, with the Consolidated-Vultee aircraft manufacturing facilities (later Convair) on the west side. The site of the base was originally selected in 1941 as a Consolidated Vultee factory for the production of B-24 Liberator bombers. A separate contract was let for a landing field, known as the Tarrant Field Airdrome, to be built to support the aircraft factory. The construction of an air force base on the east side of Tarrant Field was authorized after the Japanese attack on Pearl Harbor, and Tarrant Field Airdrome was assigned to the Army Air Forces Flying Training Command in July 1942. The base began as a pilot transition school for the B-26 Marauder before becoming one of the first B-24 transition schools in operation. After more than 4,000 students were trained in B-24s at the base, its mission was changed to B-34 transition because of the nearness to the Consolidated factory. In 1945 the mission was changed from B-34 to B-29 aircraft training. Special photo of Air Force bombers from the 1930s through the late 1940s. A Douglas B-18 "Bolo"; a Boeing B-17 "Flying Fortress"; a Boeing "B-29 Superfortress" and the B-36 "Peacemaker" dominating the group photo with a 230 Ft Wingspan. Taken at Carswell AFB after receipt of the first B-36 in 1948. Note the SAC 7th Bombardment Wing marking on the B-29. Fort Worth Army Air Field was assigned to the newly formed Strategic Air Command in March 1946, and on 1 October 1946, the 7th Bombardment Group, Very Heavy was activated. With its activation, the 7th became part of the Fifteenth Air Force (15 AF), headquartered at Colorado Springs, Colorado. Personnel and aircraft of the new group, consisting of the Boeing B-29 Superfortress, were transferred to Fort Worth AAF from the 92nd Bombardment Group at Spokane AAF, Washington. On 1 November 1946, the Eighth Air Force moved its headquarters to Fort Worth AAF from MacDill Field, Florida. With its B-29s, the 7th prepared its people for any combat eventuality that might arise, flying simulated bombing missions over various cities. On 5 July 1947, a flight of eight B-29s of the 492nd Bomb Squadron deployed from Fort Worth AAF to Yokota AB, Japan. Shortly after this the detachment received orders to redeploy to Fort Worth AAF via Washington, D.C. The aircraft left Yokota AB on 2 August, flew over the Aleutian Islands, then into Anchorage, Alaska. From Anchorage the flight flew over Edmonton, Alberta, Canada, turned south and flew over Minnesota and Wisconsin. The bombers flew a low-level flight between The Pentagon and Washington Monument in the Capitol on 3 August. Completing this aerial demonstration, they headed for Fort Worth, landing 31 hours after launch from Japan and covering 7,086 miles (11,404 km). On 12 September, the group deployed 30 B-29s to Giebelstadt Air Base, near Würzburg, West Germany. This flight was the largest bomber formation flown from Fort Worth AAF overseas to date, landing in Germany on 13 September. During their ten-day stay, the group bombers participated in training operations over Europe, as well as a show-of-force display by the United States in the early part of the Cold War with the Soviet Union. The flight redeployed from Germany on 23 September. On 17 November 1947, the 7th Bombardment Wing was established to organize and train a force capable of immediate and sustained long range offensive warfare and operations in any part of the world. The 7th Bombardment Group became its operational component. The wing's mission was to prepare for global strategic bombardment in the event of hostilities. Under various designations, the 7th Bomb Wing flew a wide variety of aircraft at the base until its inactivation in 1993. In June 1948 the first Consolidated B-36A Peacekeeper was delivered. The first B-36 was designated the "City of Fort Worth" (AF Serial No. 44-92015), and was assigned to the 492d Bomb Squadron. With the arrival of the B-36s, the wing was redesignated as the 7th Bombardment Wing, Heavy on 1 August. B-36s continued to arrive throughout 1948, with the last B-29 being transferred on 6 December to the 97th Bomb Group at Biggs AFB. For 10 years, the "Peacemaker" cast a large shadow on the Iron Curtain and served as the USAF's major nuclear weapons delivery platform. As part of the 7th Bombardment Wing, the 11th Bombardment Group was activated on 1 December with the 26th, 42d, and 98th Bombardment Squadrons, Heavy, were activated and assigned. The 11th Bombardment Group was equipped with B-36As for training. A five ship B-36 formation was flown on 15 January 1949, in an air review over Washington, D.C., commemorating the inauguration of the President of the United States, Harry S. Truman. In February 1949, a B-50 Superfortress (developed from the B-29) and named Lucky Lady II took off from Carswell for the first nonstop flight around the world. She returned to Carswell after mid-air refueling, flying 23,108 miles (37,189 km), and remaining aloft for ninety-four hours and one minute. Also on 16 February 1948, the 11th Bombardment Wing, Heavy was established. The new wing assumed control of the 11th Bombardment Group, attached to the 7th Bombardment Wing since 1 December 1948. Last B-36 flight from Carswell, 30 May 1958, flying in formation with a Convair YB-58 and Boeing B-52. During March 1950, SAC evaluated its numbered air forces. The 8 AF, at Carswell AFB, concentrated on medium and heavy bombers. Expansion and the integration of the B-36 and B-50 in the command created the need for a more balanced organization. Geographic factors also promoted the need for reorganization. For those reasons, SAC realigned the command effective 1 April 1950. Under the realignment, each numbered Air Force received bomber and reconnaissance assets in a geographic region. This left the 7th Bombardment Wing under control of Eighth Air Force. In January 1951, the 7th took part in a special training mission to the United Kingdom. The purpose of the mission was to evaluate the B-36D under simulated war plan conditions. Also, further evaluate the equivalent airspeed and compression tactics for heavy bombardment aircraft. The aircraft, staging through Limestone AFB, Maine, would land at RAF Lakenheath, United Kingdom, following a night radar bombing attack on Helgoland, Germany. From there the bombers would conduct a simulated bomb run on the Heston Bomb Plot, London, finally landing at RAF Lakenheath. This was the first deployment of wing and SAC B-36 aircraft to England and Europe. For the next four days the flight flew sorties out of England. The aircraft redeployed to the states on 20 January arriving at Carswell on 21 January. The 19th Air Division, Bombardment, was redesignated 1 February 1951 as the 19th Air Division, was organized on 16 February at Carswell. With this move the division assumed responsibility over the 7th and 11th Bomb Wings at Carswell. In 1954, Carswell was prominently featured and used as a filming location in the James Stewart and June Allyson film Strategic Air Command. On 13 June 1955, the Strategic Air Command realigned its three numbered air forces resulting in Headquarters, 8 AF moving from Carswell to Westover AFB, Massachusetts. With that move, Carswell was reassigned under Second Air Force (2 AF), headquartered at Barksdale AFB, Louisiana. On 10 December 1957, the 98th Bombardment Squadron was detached from the 11th Bombardment Wing and assigned to the newly 0rganized 4123d Strategic Wing. This would become the first Boeing B-52 Stratofortress unit at Carswell. During January 1958, the wing began transferring its B-36 bombers to various SAC wings. On 20 January, the wing transferred all B-52 equipment and property on hand to the 4123rd Strategic Wing in order to facilitate that organization's conversion, which was scheduled several months ahead of the 7th Bomb Wing at Carswell. The 7th Bombardment Wing officially became a B-52 organization with the adoption of manning documents and equipping authorizations on 1 February 1958. On 19 February 1958, the 4123d Strategic Wing took possession of the first Boeing B-52 Stratofortress on Carswell. At the arrival ceremony on base the bomber was named "The City of Fort Worth". It was subsequently assigned to the 98th Bombardment Squadron of the wing. Shortly following the arrival of B-52 bombers to the 4123rd Strategic Wing, the unit was moved to new facilities at Clinton-Sherman AFB, Oklahoma. With the acquisition of the Boeing B-52 Stratofortress, all new B-52 wings would operate with an air refueling squadron to support those bombers. As a result, SAC activated the 7th Air Refueling Squadron at Carswell on 1 April 1958, and assigned it to the wing. The squadron would be equipped with the Boeing KC-135 Stratotanker later in the year. On 30 May, Memorial Day, the last of the B-36's in the wing were retired with appropriate ceremonies and "Open House". Air Force and civilian personnel of the base, and civilians from surrounding communities were on hand to bid the "Peacemaker" a fond farewell. This last flight of a B-36 from Carswell AFB phased out completely the B-36 program in the wing. In January 1959. B-52s from Carswell were constantly in the air and deployed to SAC Reflex bases in Europe, Asia, and North Africa during the Cold War. Convair B-58A-10-CF Hustler AF Serial No. 59-2458 of the 43d Bomb Wing. This aircraft set transcontinental speed record 03/05/62 by flying nonstop from Los Angeles to New York and back again. First leg at average speed of 1214.71 mph, return leg at average speed of 1081.77 mph. Return leg was first transcontinental flight that moved across the country faster than the rotational speed of the earth. Crew awarded Bendix and Mackay Trophies. Now on display at the National Museum of the United States Air Force, Wright-Patterson Air Force Base, Ohio. In January 1960, the USAF announced its intention to activate the first Convair B-58 Hustler Wing. This was to be the 43d Bombardment Wing, (BW) at that time based at Davis-Monthan AFB, Arizona. The 43rd BW would be moved to Carswell starting on 1 March. The 3958th Operational Test and Evaluation Group (then functioning as an integral unit at Carswell) would be transferred to the 43rd BW upon its arrival. On 1 August 1960, the USAF finally formally assumed B-58 operations responsibility and began testing. 59–2436, the first fully operational Hustler equipped with all tactical systems, was delivered to the 43rd. Two weeks later, the first TB-58A was delivered to Carswell. On 23 March, a test unit B-58A (55-0671), remained airborne for 18 hours 10 minutes while averaging an airspeed of 620 mph (1,000 km/h) over 11,000 miles (18,000 km). This was apparently the longest-lasting single flight ever by a B-58. The 43rd BW received deliveries beginning in December 1960. However, technical difficulties continued to plague the B-58, and on 10 March 1961 SAC had once again to set back the operational readiness date of the 43rd BW. The 43rd BW, was finally declared operationally ready in August 1962. The Wing was placed on alert in September. One of its first duties of the 43d was to operate a school to evaluate the new supersonic jet bomber. This was made possible by training SAC aircrews using the F-102 Delta Dagger it having similar flight characteristics unique to flying a delta-winged aircraft. The wing received TB-58s, the training version of the bomber and then the YRB-58 reconnaissance version soon followed and the wing took on still another important mission. On 12 January 1961, Major Henry J. Deutschendorf commanded a B-58 crew from the 43rd that set out to break six flight records; five of which the Soviet Union held. The Hustler flew two laps around a course with Edwards AFB, California, at one end and Yuma, Arizona, at the other. The bomber set three speed records over the 1000 kilometer (km) course with a 2000 kilogram (kg), 1000 kg, and 0 kg payload—averaging 1,200.194 miles per hour (mph) in each category. The crew managed an average speed of 1,061.88 mph (1,708.93 km/h) in each of the same payload categories over the 2000 km course. This flight set the pace for the 43rd with the B-58. Crews set two more flight records with their Hustlers in 1961. On 10 May, Major Elmer E. Murphy flew his Hustler 669.4 miles (1,077.3 km) in 30 minutes 45 seconds. Averaging 1,302 mph (2,095 km/h), Major Bleriot set a new record for sustained speed and earned France's Bleriot Cup. Sixteen days later a Hustler flew from New York City to Paris, France in 3 hours, 19 minutes, and 41 seconds. The crew on this flight was Major William Payne, pilot, Captain William L. Polhemus, navigator and Captain Raymond R. Wagenger, DSO. The B-58 averaged 1,089 mph (1,753 km/h) along the 4,612-mile (7,422 km) course and completed in 1/10 the time it took Charles Lindbergh in 1927. This transatlantic flight earned the crew the seventh Mackay Trophy and the Harmon International Trophy. Tragically, this aircraft (59-2451 B-58A-CF "The Firefly") was destroyed during an attempted low-altitude aerobatic flight in marginal weather. Its crew,(pilot Maj. Elmer Murphy, nav/bombardier Maj. Eugene Moses, DSO 1st Lt. David Dickerson) were killed when the B-58 crashed on 3 June at the Paris Air Show. Though saddened by the loss, crews from the 43rd continued to set records with the Hustler. Captain Robert G. Sowers piloted a B-58 that set out to break three speed records on 5 March 1962. Referred to as Operation Heat Rise, the 43rd Bomb Wing B-58 59-2458 (shown above) flew from New York to Los Angeles and back to New York in 4 hours, 41 minutes, and 14.98 seconds. The crew took the bomber from New York to Los Angeles in two hours, 15 minutes, and 50.8 seconds—beating the sun across the United States. The return trip took 2 hours and 58.71 seconds, averaging 1,214.65 mph (1,954.79 km/h). All three crewmen earned the Mackay Trophy, the Bendix Trophy, Distinguished Flying Crosses, and congratulations from president John F. Kennedy. After July 1961, the wing continued further B-58 evaluations until June 1962. From then until the close of 1969 the wing served as one of two SAC B-58 wings with a strategic bombardment mission. One of the last things the wing did while at Carswell AFB took place on 28 March 1964, the day after a major earthquake devastated Alaska. Headquarters USAF tasked the 43rd to provide it with photographs of the region hit by the quake. Members of the 43rd flew two B-58s the 5,751 miles (9,255 km) to Alaska and back, processed the film, and then delivered the pictures to Washington DC 14.5 hours after the wing received the request. Six months later the 43rd Bomb Wing moved to Little Rock AFB, Arkansas. Boeing B-52D-40-BW Stratofortress AF Serial No. 56-0687 on display at the B-52 Memorial Park, Orlando International Airport, Florida. This aircraft was flown to Orlando from Carswell for display at the former McCoy AFB, now Orlando International Airport, when the B-52D was being phased out of the SAC inventory in 1984. On 13 April 1965, the 7 BW deployed its forces to Andersen Air Force Base, Guam to support SAC combat operations in Southeast Asia. Most of the wing's bombers and tankers, along with aircrews and some support personnel, were deployed. At Andersen AFB, the wing flew more than 1,300 missions over Vietnam, and returned to Carswell in December 1965. B-52 crews were sent through an intensive two-week course on the B-52D, making them eligible for duty in Southeast Asia. B-52s assigned to combat duty in Vietnam were painted in a modified camouflage scheme with the undersides, lower fuselage, and both sides of the vertical fin being painted in a glossy black. 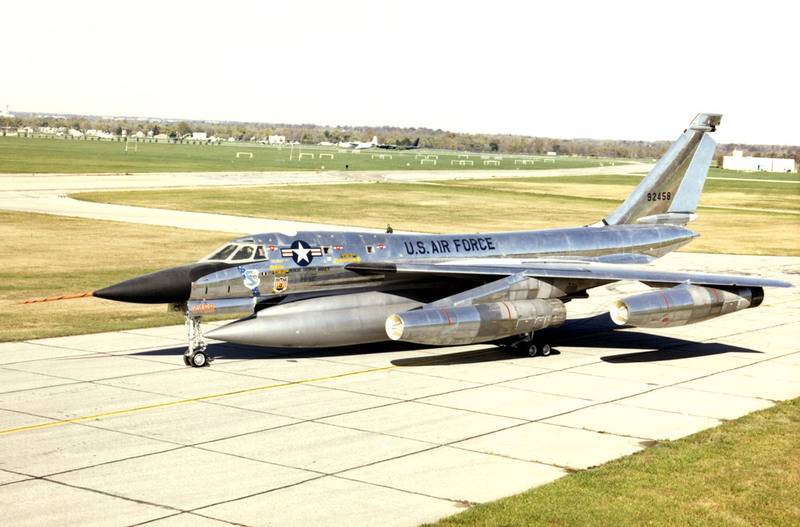 The USAF serial number was painted in black on the fin over a horizontal red stripe across the length of the fin. The B-52 effort was concentrated primarily against suspected Viet Cong targets in South Vietnam, but the Ho Chi Min Trail and targets in Laos were also hit. During the relief of Khe Sanh, unbroken waves of six aircraft, attacking every three hours, dropped bombs as close as 900 feet (270 m) from friendly lines. Cambodia was increasingly bombed by B-52s from March 1969 onward. Rotational deployments to Guam, and also to U-Tapao Royal Thai Navy Airfield, Thailand continued on a reduced scale until 1975. In addition to the B-52 deployments, the United States Air Force Reserve 916th Troop Carrier Group, flew Douglas C-124 Globemaster II aircraft from Carswell. It was activated on 1 April 1963. The group supported missions included military airlift to South Vietnam beginning in 1965 and to U.S. forces in the Dominican Republic during a 1965 crisis. It also participated in numerous humanitarian airlift missions. as well as performed tactical airlift missions within the United States. Beginning in 1972, the 301st Fighter Wing (under various designations) has trained at Carswell as an Air Force Reserve Command unit, training for tactical air missions, including counter-air, interdiction, and close air support. Originally gained by the former Tactical Air Command (TAC), the unit is now operationally gained by Air Combat Command (ACC). The 301st replaced the Air Force Reserve's 916th Military Airlift Group (916 MAG), which was inactivated. The 301st's 457th Tactical Fighter Squadron flew the F-105 Thunderchief from 1972 to 1982. It transitioned to the F-4 Phantom II in 1981, then to the F-16 Fighting Falcon in 1990. The wing has participated in exercises, both within the United States and abroad. It deployed a security police flight to southwest Asia during Operation Desert Storm, January–March 1991, and supported Operation Deny Flight in the Balkans in the mid-1990s. The tail code carried by the present day 457th Fighter Squadron is "TX". In the 1980s the base received several new weapons systems, including modified B-52H aircraft. In 1983, B-52 crews began training with a new weapon system, the SRAM (Short Range Attack Missile) and later, in 1985, the ALCM (Air Launched Cruise Missile). Also, the wing flew numerous atmospheric sampling missions during 1986 and 1987 in response to the Chernobyl nuclear reactor accident; four B-52H aircraft (s/n 60-0024, 60-0033, 60-0051 and 60-0052) were modified to carry atmospheric sampling pods code-named "Giant Fish". These aircraft flew the mission into the 1990s from various bases including Carswell. By 1984 Carswell was the largest unit of its kind in the Strategic Air Command. The west side of the airfield was home to Air Force Plant 4, a 602-acre (2.44 km2) industrial complex occupied over the decades by Convair, General Dynamics, and now by Lockheed Martin. The bulk of the Air Force Convair B-36, B-58 Hustler, F-111 Aardvark, EF-111 Raven and F-16 Fighting Falcon fleets were built there. The 7 BW contributed personnel to Operation Desert Storm in the Middle East in 1991. After an overwhelming victory in the Persian Gulf, the wing returned to Carswell. In September 1991 with the end of the Cold War, President Bush ordered a stand down of all nuclear alert duties. Lockheed C-130H-LM Hercules AF Serial No. 85-1362 from the Texas Air National Guard's 136th Airlift Wing based at NAS Fort Worth JRB, Carswell Field on the ramp at Bagram AB, Afghanistan on Wednesday, 31 May 2006. Carswell AFB was selected for closure under the Defense Base Closure and Realignment Act of 1990 during Round II Base Closure Commission deliberations (BRAC 91). As part of BRAC 91, the decision was made to relocate the 7th Bomb Wing from Carswell AFB to Dyess AFB. During the 1992 Air Force-wide reorganization, the SAC was disestablished on 1 June. Carswell and the 7th Bomb Wing were assigned to the newly created Air Combat Command (ACC), and the B-52Hs assigned to the wing were given the ACC tail code "CW". First-stage closure activities were initiated in 1992 and B-52H aircraft were relocated to Barksdale AFB, Louisiana by January 1993. The 7 BW was released of all operational capabilities on 1 January 1993, and was transferred to Dyess AFB, Texas without personnel or equipment on 1 October 1993 where it currently flies the B-1 Lancer. Carswell ceased USAF active duty operations on 30 September 1993, and was transferred to the Air Force Base Conversion Agency (AFBCA) for property distribution and reuse. On 1 October 1993, the Air Force Reserve's 301st Fighter Wing assumed base responsibilities, establishing Carswell as Carswell Air Reserve Station. The Air Force Reserve's Headquarters, 10th Air Force (10 AF), also relocated to Carswell from Bergstrom AFB, Texas as a result of the BRAC action which closed Bergstrom. In 1993, Congress directed the establishment of the nation's first joint reserve base under the Base Realignment and Closure authority. The USAF ended operational control of Carswell on 30 September 1994 with the transfer of the property to the United States Navy. The base retained the name Carswell Air Force Base until 1993. At that time, the Base Realignment and Closure (BRAC) Commission decided to relocate assets from Naval Air Station Dallas to Carswell Air Force Base. Recommissioned on 1 October 1994 as Naval Air Station Joint Reserve Base Fort Worth (but also retaining the name Carswell Field) Two Marine Corps squadrons and a small contingent of Navy personnel had permanently relocated at that time and all moves were completed by 1998. On September 20, 2009, the airport was used as a refueling stop for the Shuttle Carrier Aircraft (SCA) piggybacking the Space Shuttle Discovery back to the Kennedy Space Center (KSC) from Amarillo after STS-128. The short hops between refueling the SCA were due to the heavy payload still inside the orbiter, specifically the Leonardo (ISS module) that carried wastes from the International Space Station. After refueling, the tandem flew to Barksdale Air Force Base, using most of the runway. This was the last flight of a Space Shuttle between Edwards Air Force Base and Kennedy Space Center; all of the remaining landings of the Shuttle were at KSC. Naval Air Station Fort Worth Joint Reserve Base, part of Navy Installation Command's Navy Region Southeast, is a joint defense facility which plays a pivotal role in training and equipping air crews and aviation ground support personnel. The Navy Fort Worth "team" ensures reservists receive quality training in preparation for mobilization readiness; here to serve the reservists, tenants, and surrounding communities while accomplishing its primary purpose of defense readiness for the United States. The base, now part of Navy Installations Command (CNIC), is under the oversight of Commander, Navy Region Southeast. It hosts a variety of fighter/attack and airlift units from the reserve components of Navy, Marine Corps and United States Air Force. Airfield operating procedures and equipment (e.g., PAR and ILS) reflect a combination of service requirements, although as the operators of the local air traffic control (ATC) system, the United States Department of the Navy imposes Navy procedures as the operations standard. As of June 2011, there were 11,300 employees on NAS Fort Worth JRB (including active duty, reserve, national guard, and civilians). NAS Fort Worth JRB units schedule a variety of airspace. The key area for fighter operations is the Brownwood Military Operations Area (MOA). This area, originally developed to serve Commander, Naval Air Force Reserve (COMNAVAIRRESFOR) and 4th Marine Aircraft Wing fighter and fighter/attack squadrons stationed at the former Naval Air Station Dallas, now serves as the primary airspace resource for all fighter/attack units assigned to NAS Fort Worth JRB. It is scheduled by the NAS Operations Department; consolidated scheduling was evaluated for a period of time and the decision made to return this area to the Navy for scheduling. Nevertheless, user comments indicate that access to the area is allocated to its several users on a fair and equitable basis. The recent decision to join the Brady and Brownwood MOAs will provide additional maneuver airspace for AIC/ACM training. When scheduled concurrently, these areas enable numerous aircraft from several units to participate in joint fighter/bomber training exercises. Brownwood MOA is the subject of an innovative test to improve the dissemination of SUA status information to non-participating aircraft. This test, conducted to address action items in meeting Federal Aviation Administration (FAA) Free Flight planning commitments, will use a combination of recently deployed airspace scheduling and reporting systems, including the FAA Special-use Airspace Management System (SAMS) and United States Department of Defense Military Airspace Management System (MAMS). The intent of the trial is to provide more accurate "near real-time" area status via the internet to civilian users, especially to regional air carriers particularly affected by required rerouting around Brownwood MOA. Should the test and the technology prove successful and cost-effective, the result could address long-standing civilian dissatisfaction with the quality and timeliness of FAA-distributed special use airspace status information. In particular, such functionality may be appropriate for incorporation into the next generation of Automated Flight Service Station modernization equipment. The base's runway is also used by Lockheed Martin Aeronautics, as their large Fort Worth assembly facility (where the F-16 Fighting Falcon and the F-35 Lightning II are built) is located adjacent to the base. The Commanding Officer of NAS Fort Worth JRB is Captain Robert A. Bennett. Federal Medical Center, Carswell, a Federal Bureau of Prisons facility, is located in the northeast corner of NAS Fort Worth JRB. Its address is Building 3000 along J Street. The base was one of the sites for the filming of James Stewart's 1955 film, Strategic Air Command. On the NBC series The West Wing, Democratic Presidential nominee Matt Santos (Jimmy Smits) reported for Marine Corps Reserve duty at Fort Worth for F/A-18 Hornet flight operations. The show incorrectly referred to the base as "National Guard Training Center Fort Worth", and the squadron shown was VMFA-134 "Smokes". In reality, the "Smokes" were stationed at Marine Corps Air Station Miramar prior to their 2007 transition to cadre status. The Marine Corps Reserve F/A-18 squadron actually based at NAS Fort Worth JRB is VMFA-112 "Cowboys". ↑ "White Settlement city, Texas." U.S. Census Bureau. Retrieved on May 24, 2010. ↑ "Westworth Village city, Texas." U.S. Census Bureau. Retrieved on May 24, 2010. ↑ "White Settlement city, Texas." U.S. Census Bureau. Retrieved on 24 May 2010. ↑ "Westworth Village city, Texas." U.S. Census Bureau. Retrieved on 24 May 2010. ↑ B-58.com. B-58.com. Retrieved on 2013-09-18. ↑ "FMC Carswell." Federal Bureau of Prisons. Retrieved on May 24, 2010. ↑ FMC Carswell Contact Information." Federal Bureau of Prisons. Retrieved on May 24, 2010. Handbook of Texas Online: Carswell Air Force Base. Retrieved 18 October 2005. U.S. Geological Survey Geographic Names Information System: Carswell Air Force Base. Retrieved 26 July 2005.